R&S Metal Building Skylights optimize the natural daylight potential of any any low-rise commercial or warehouse space. 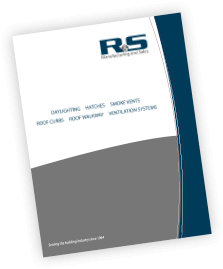 Our skylight systems include everything needed for a complete install. This includes a metal building roof curb, OSHA-compliant fall protection screen, curb liners and mounting hardware. With over 50 years’ experience in the metal building industry, we provide solutions that when installed correctly, will not leak. R&S also offers OSHA-Compliant fall protection screens for flat light panels (LTP). These kits also include all sealants and mounting hardware. WORRY-FREE PURCHASE EXPERIENCE: All metal building skylights and fall protection products undergo testing and certification to insure the highest level of performance and safety. View our product listings for more information. PROFESSIONAL SERVICES – Our free consultative services can help you design a daylighting plan that meets lighting requirements and National Energy Code standards. Contact Us to learn more.